The Jumbo Double Lane Jump and Slide is the perfect bouncer for any rental business, school, church or other institution. This commercial grade combo bounce house meets all needs with the giant 18'x18' jump area and very large 15' double lane slide. Enter in the bouncer and jump around and then when they are ready they can climb up the built in ladder and go down the slide! Kids will love this commercial combo unit any time of year! The Jumbo Double Lane Jump and Slide is the perfect bouncer for any rental business, school, church or other institution. 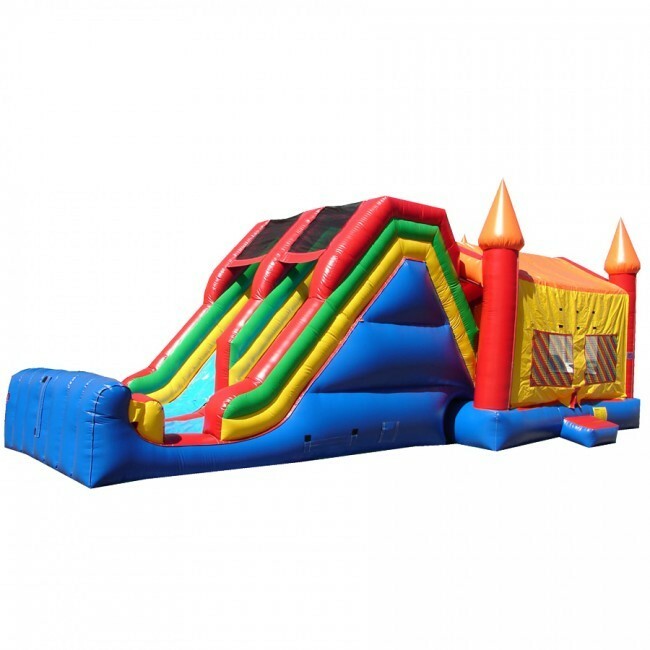 This commercial grade combo bounce house meets all needs with the giant 18'x18' jump area and very large 15' double lane slide. Enter in the bouncer and jump around and then when they are ready they can climb up the built in ladder and go down the slide! Inside the bouncer is also a hoop to play ball with. Kids will love this commercial combo unit any time of year!